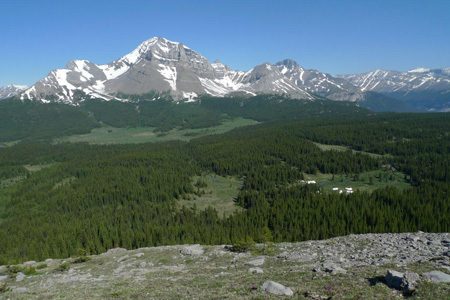 Our 2019 camp is at Sunset Pass which is north of the Saskatchewan River Crossing on the Icefields Parkway in Banff National Park. This is a beautiful site and was last visited in 2012 (see video below) and 2007 (see video in the Galleries). Registration is open. Book Now! 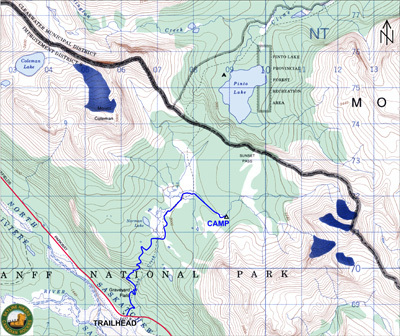 The camp is located in the valley between Mount Coleman and Mount Wilson. The camp site straddles Norman Creek which has several excellent places for swimming. 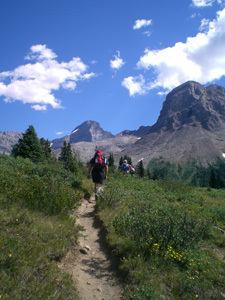 The moderate trail into camp starts at the Sunset Pass trailhead on the Icefields Parkway and is about 7 km in length. 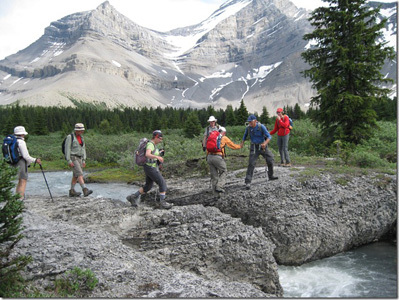 It starts with a 500 meter climb along Norman Creek with lookouts into the gorge and waterfalls. 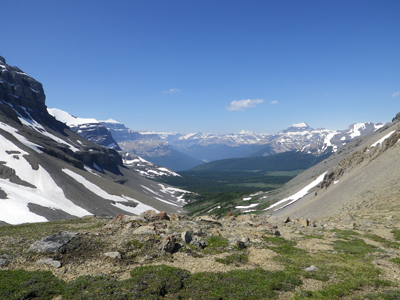 Once past this initial climb, the valley broadens with sweeping views of the surrounding mountains and the remainder of the hike into camp is relatively easy with 100 meters of elevation gain. 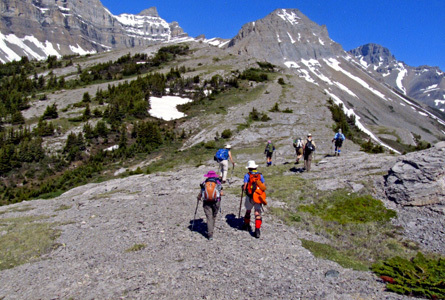 A choice of 5 or 6 hikes will be offered each day from camp. 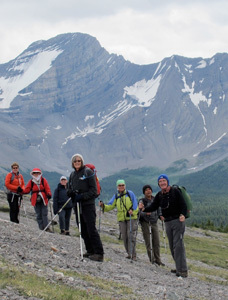 Each day hike is led by a volunteer leader. 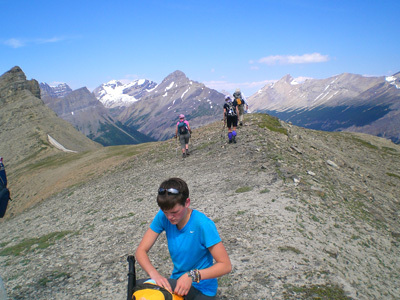 Hikers should be prepared to hike over rough trails (many above the tree line) for 5 to 25 km per day with elevation gains of 200 to 1000 meters. 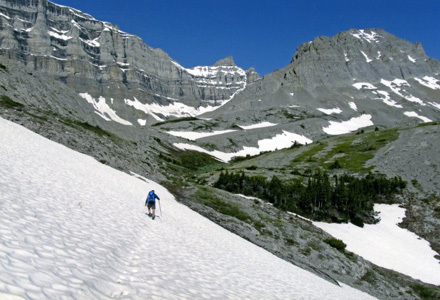 Hike times average 6 to 7 hours per day including stops. 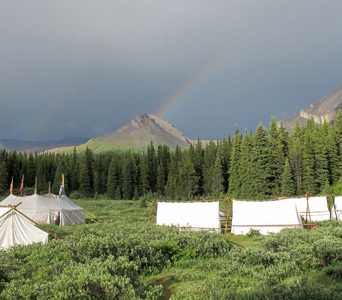 Camp life provides an interesting contrast to the peacefulness of the trail. 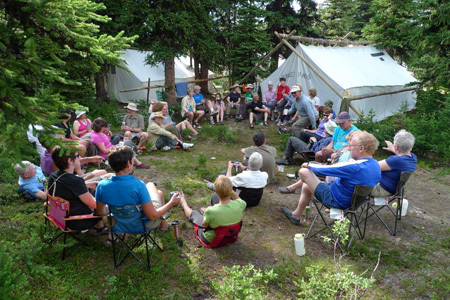 Meal times in the dining tent are happy, noisy affairs. 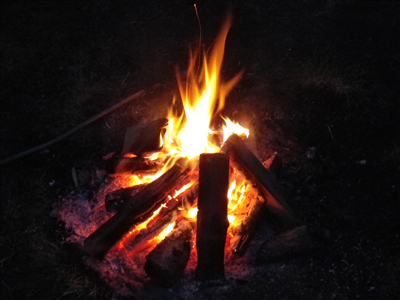 The camaraderie continues around the evening campfire where a description of hikes planned for the following day are given. 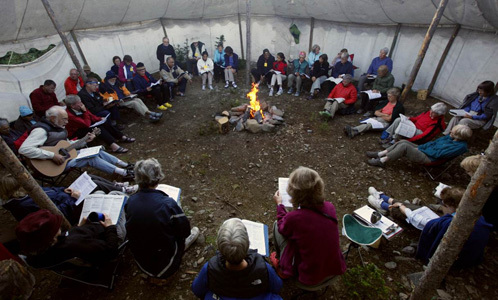 It is also a time for singing, recounting of the day's events and telling of tall tales. Shown below is a topographical map from the Government of Canada's GeoGratis service (used under license). Click on the map to see a larger image.